When this book was first released last October, reviewers noted how dark it was. Indeed, this book is very heavy in tone and creepyness. Much more so than the previous two books. Even though the second book had its strange oddities too. I found some of the chapters from the perspective of the villain hard to get through. Still, I finished this book in two evenings so it was not that bad. The other minor quibble I have with this book is the relationship between Robin and Cormoran. The constant push and pull between them is getting tiring. It is not say that I either do or do not want them together, but the constant speculation in the book from all sorts of characters is overdone now. Secondly, I am finding Robin is a bit too perfect. There is even a line in this book that says “everyone likes Robin” especially animals. I like Robin too and I guess her biggest flaw is her taste in men. I continue to love many of the supporting or tertiary characters. In this book, I like the new side characters such as Wardle and Shanker. Rowling does have a way with dialogue and quick backstory that reveals a lot about the characters. 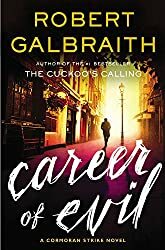 I like all of Cormoran’s associates except I do not care (and do not think we are suppose to care) for his female romantic partners. I have notied that Rowling’s writing has improved too overall over the years. I like her descriptions even more. One of the women in this book “had a look of a Bruegel peasant, with her rounded cheeks, prominent chin and wide nose.” She also continues to be verbose. In this novel, some words that I rarely use, but would like to: chicanery, holdall, pierrot, and perpatetic. I am glad she is writing for adults. Finally, one thing I love about this series is how the setting is a supporting character in itself. I know Rowling does not live in London, but she writes it extremely well especially the current modern London. I had to laugh out loud because my alma matter is mentioned and couple of scenes in the book are set in the area. The line about poverty and the relentless distinctions are very true to London. To any big city? Yes, but to a city in a country where classism still has history, the side by side of the haves and have-nots is both viscereal and subtle. Reading this book has made me look forward to the TV adaptation that will be forthcoming. I wonder who will be cast and how and when they get the right tone for the show. I have a knack for reading these novels during the season they are set. During this one, Easter weekend came and went too. I enjoy reading these books, but I do know that there are issues with the style of the plotting and some other character issues. Still, I can not deny that I enjoy Rowling as a writer and have seen I was a kid. In a couple of years, I’ll have said that I’ve been reading this woman’s books for twenty years Keep at it, Ms Rowling. I know what you mean about the back and forth with Robin and Cormoran, but not so sure about the Robin perfection. I feel like this book showed us the cracks in her facade and that she became more of a real character for me. I still need to watch the last TV adaptation of a Rowling novel (Casual Vacancy), I didn’t know they were adapting this one! Are they doing the whole series? Hi Geoff! I still really like Robin, and I do not think she is a Mary Sue. At the beginning of the novel, I started to realize she was a wee bit perfect. Even her cracks make her a great character because in the end, everything worked out for her even when she was rash. But as I say, I think her weakness is steadfastness to her partner. They are going to the do whole series, with one season/series per book. The script writer who adapted Casual Vacancy is adapting the first book. However, the news about the TV show officially titled “The Cormoran Strike Mysteries” has been quiet which makes me wonder if it’ll be pushed forward to 2017 rather than 2016 air date that people were speculating. I’m looking forward to it because I think the books have great TV potential if they cast the right actors. Thanks for the comment. Happy Easter weekend!